TAVISTOCK (NZ) (Bay 2005-Stud 2010). 6 wins-1 at 2, Waikato Draught Sprint, Gr.1. Champion Sire in Hong Kong in 2015-16. Sire of 246 rnrs, 157 wnrs, 17 SW, inc. Werther (HKJC Audemars Piguet Queen Elizabeth II Cup, Gr.1), Tarzino, Tavago, Volkstok'n'barrell, Tavidream - Circuit Glory (H.K. ), Hasselhoof, Tomelilla, Hiflyer, Gobstopper, Pacorus, Infantry, Avisto, Longchamp, Nymph Monte, Won Won Too, Tavy, Titanium, SP Tavisan, Milseain, etc. Magstock (g. by Tavistock). 4 wins. See below. Twizzler (f. by Zabeel). Winner at 1600m in Aust. Nine Times (f. by Tale of the Cat). Winner at 1400m in Aust. Exert. 6 wins at 1100m, 1200m, A$99,886, to 2018-19 in Aust. Quarterly. 2 wins at 1100m, 1200m, BRC Yellowglen H., Mittys P.
Bouledogue. Winner at 1300m, 2d MRC (Mornington) Land Engineering P.
Filbert Way. 2 wins at 1400m, 1600m in 2017-18, 3d MRC Clanbrooke Racing H.
Magravine. 3 wins. See above. Arisma. Winner at 1000m, 2d STC Tooheys New 2YO H., 3d BTC Richmond Grove H., 4th AJC Gimcrack S., L. Producer. Madam Archer. 3 wins from 1600m to 1900m in Aust. Lady With Style. 2 wins at 900m, 1100m in Aust. Producer. Misprint. Winner at 1250m in 2017-18, 3d BRC Sky Thoroughbred Central 2YO H., Ipswich TC CFMEU Mining & Energy 2YO H., BRC Sky Thoroughbred Central 2YO P.
Share Share. 6 wins at 1300m, 1400m to 2018 in Philippines. Crimson Star. 2 wins-1 at 2-at 800m, 1050m to 2017-18 in Aust. Banoon. 11 wins from 1200m to 1600m, A$171,730, AJC CIG Flying Welter H., Bankstown H., STC Payless Carpets Series H., AWA Traffic Welter H., AJC Hoyts Television H., Mitsubishi Diamond Series H., 2d AJC At Sea Welter H., STC Club Marconi Welter H., Panania Hotel H., Banana Series H., 3d STC Snuff Flying Welter H., AJC Charles Sturt H., STC 2WS Welter H., Legacy Donors Torch H.
Butzie (Delago Brom). 6 wins from 1400m to 1650m, A$95,837, Tasmanian One Thousand Guineas, TTC Private Function Catering H., Magic Million Yearling Sales H., TROA (North) H., 2d MRC Ken Hilton H., TTC F&W Stewart H., Robson Tool King H., 3d Tasmanian Oaks, L, TRC Hutchins School H., Prime Plan Securities Pty Ltd H., TTC Tote Sport Radio H., Veolia Enviromental Services H. Producer. Chanzig. Winner at 2, WATC Crown Golden Ale 2YO P., 2d WATC Westspeed 2YO P.
OUR CURE (Sir Tristram). 5 wins. See above. BIG GREY ROO (Three Legs). 5 wins-2 at 2-from 1000m to 2050m, A$239,200, MVRC Herald Vase S., L, David Wynn Wines H., 2d Moonee Valley S., Gr.2, 3d Victoria Derby, Gr.1. Race Record: 26 Starts 4-5-4 A$0, S$268,250. 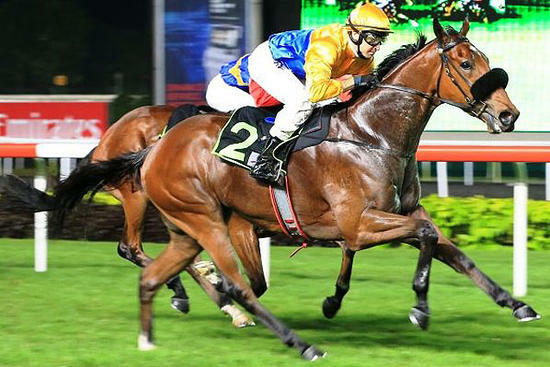 4 wins from 1400m to 1800m, S$268,250, to 2017, Singapore TC Mexican Rose S., Kranji C S., Hello New York S., 2d Singapore TC Colonial Chief S., L, Penang Turf Club Trophy, Helping Hand S., Class 3 H., Class 4 H., 3d Singapore TC Super Gold S., Mark Walker S., Class 3 H.